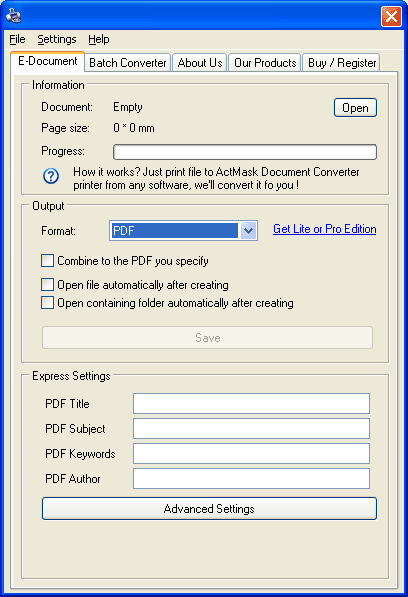 ActMask Document Converter X allows you to convert any printable file to PDF, JPG, TIFF, PNG, BMP, GIF, TGA, PCX, EMF, SPL (Print Spooling File) from any Windows software. With Batch Converter feature, it allows you to bulk convert documents to PDF/Image/EMF/SPL files with just One click. In addition, you can handle the PDF Optimization, automatization, Watermark, Printer Tools, WinZip compressing and FTP distribution functions. To develop your software based on ActMask PDF / Image Virtual Printer SDK, see http://www.all2pdf.com Highlight Features: 2 Steps to convert document to professional-quality PDF, TXT, Multi-page TIFF, JPG, GIF, BMP, PNG, TGA, PCX, EMF (Enhanced-format metafiles) or SPL (Print Spooling File). Convert any printable document to professional-quality, searchable PDF from any Windows application via ActMask Document Converter Virtual Printer. To ensure portability you can embed fonts in PDF file. Complete control of PDF output with features like PDF Document Description (such as Title, Author, Subject, Keywords etc. ), Font embedding, Compression options, Optimization options and more. 128 Bits Encryption. Merge Multiple Documents into one Single PDF File. TXT / Image Conversion. Batch Converter Capability. Bulk convert documents to PDF, JPG, GIF, TIFF, BMP, PNG, TGA, PCX, EMF or SPL with just 1 Click. Eximious Resizing Capability for Conversion. Combine Multiple Pages into one Single TIFF File. Custom watermark for PDF / Image layout. WinZip Distribution feature. FTP Distribution feature. Setup Printer easier. Use built-in Printer Tools to setup page size or DPI of printer easier. Simple and convenient user operations. Pick up file name from virtual printer stream automatically. This site does not contain serial number, crack, keygen ActMask Document Converter X serial number : serial number is the simplest type of crack. A serial number(cdkey,product key,etc) is register the program as you may already know. a crack or keygen may contain harmful software. If you cannot find the exact version you want, just give it a try. for more information read .nfo/.txt/.diz file include in zipped file.